Le Mans posters: 24 Hours Of Le Mans 1969. Depailler And Jabouille In Theri Alpine A220. 24 Hours Of Le Mans 1969. Depailler And Jabouille In Theri Alpine A220. 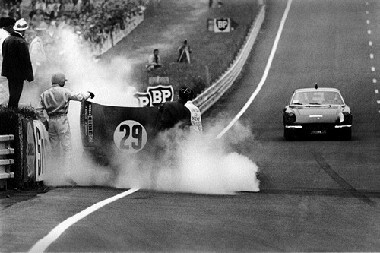 Alpine sent four Prototypes of its new A220 powered by their 3-liter V8 eingine to Le Mans in 1969 but came away with nothing. All four retired with broken engines, the car of Patrick Depailler and Jean Pierre Jabouille last of them to retire in the eighteenth hour of the race. Motorsport Classic Poster. Do you have a question concerning our product '24 Hours Of Le Mans 1969. Depailler And Jabouille In Theri Alpine A220.' ?